I put the last of the missionary pictures on my previous post for all you missionary moms and dads. It has been a privilege, an honor, a blessing and a joy to have served in the Kenya Nairobi Mission. I have loved getting to know the people of Kenya and of Tanzania, the great missionaries, our wonderful president and his wife, our friends, neighbors, and acquaintances, (including the people on the street, in stores and restaurants, and those constantly on guard). I love and care about the families of our missionaries that I got to know through email contact. You will always be in our hearts and memories. Kenya is a beautiful country with beautiful people and I will be forever grateful to the Lord for sending us there. The Gospel of Jesus Christ is true. Heavenly Father is literally our father in heaven and He loves us and wants us to be eternally happy. His Son, Jesus Christ, made it possible, through the gift of his Atonement, for us to return to live with Them and with our families in the eternities. The scriptures are true and I feel closer to Heavenly Father and to Jesus Christ as I read them. I appreciate the fact that Jesus is the Jehovah of the Old Testament, and that He is the Messiah of the New Testament, and the Savior of the world in the Book of Mormon. These books have become "one in thine hand" as they testify of Jesus and His love for us. (See Ezekiel 37:17). For more information about the Church of Jesus Christ of Latter-day Saints, go to <www.mormon.org>. 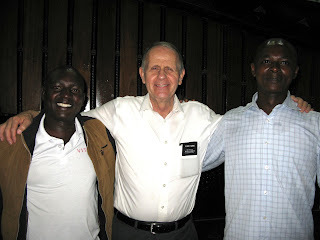 For news of the church in Kenya see <www.mormonnewsroom.co.ke>. Below are photos we took during our last two days, trying to get photos of all our friends and neighbors. This is just a handful. There are many other pictures of those we love scattered throughout our previous posts. There's a market at Galleria Mall, close to where we live, full of many, many shops selling native handicrafts. Since I don't like to be hassled about buying, I prefer the shops where they don't do that. Not too many don't hassle people but this sweet lady, Alice, never bugged me about buying. She just stood by, waiting to tell me that that particular necklace was made of recycled paper, or of coconut tree bark, or of hand-made beads. She gave me information without being overbearing and I loved it. That's why I shopped there. I told her that if everyone was like her, I would love to shop there. I shared the gospel with her and even though she has her own religion, she was happy to discuss hers and my beliefs about Jesus Christ. I told her what I told most people -- that it's always good to learn more about Jesus Christ and she totally agreed. Such a joy to talk with Kenyans about Jesus Christ!!! I love our neighbor girl, Faye. I've always told Faye that she has a really good mother because she has such good manners so her mother has taught her well. Faye is a kind, very thoughtful, and talented girl. She sings and dances and acts in plays. I love her lots and hope to see her again someday. I love her mother also. She's my Kenyan daughter. Crazy to say but we loved the guards who guarded our compound. I'm sure they can be tough when they need to be (they are policemen -- and not corrupt policemen -- who carry guns) but they were a joy to visit with. We loved Charles (and also another Charles, Jonathan, David, and Nicodemus). We shared the gospel with them also and they were thrilled to get more information about Jesus Christ. Our neighbor, Vera, and her two cute sons are from China. Nice to get to know them a bit. Vera's husband was at work this day so is not in the picture. Interesting that they have two children (because as you remember, China has had a one-child policy, which is changing a bit). Vera gave us medallions from the Beijing Olympics. How did she know that I collect coins? And how did she know that we've been to Beijing and we've walked on the grounds of the Olympics. So the medallions were a treasure to us. Of course I love my Indian daughter, Pooja!! Pooja and her husband, Shrikant, were the first adults we met when we moved into the compound. They lived in the flat right next to us and then they moved to a different building and then we moved too and were close neighbors again. Pooja, Hash, Shrikant with Vivan. This picture shows you that even though the picture looks good on the camera, you really need to use a flash inside. And this picture shows what happens when your camera is on the wrong setting. Sad. This is Robert, a guard on the street (yes, even streets have barricades) with whom we regularly talked. We shared the gospel with him and he was happy to get a Book of Mormon to read. He has his own religion, and that's great. He's a very good family man. Robert posed again but this time without his hat. I've never seen him without a hat before! LeRon worked very closely with Peter, our housing employee who is also a part-time chicken farmer. Peter and his wife Pauline are building more chicken barns to raise more chickens to sell more eggs. Good for them! We were astounded at the size of these trees. Peter and Pauline planted them as sticks five years ago and look at them now. Trees would never grow that quickly here in Alberta, Canada. Peter and Pauline's cute little girls, Lexie and Amelia, love to be out at the farm, digging in the dirt, and just having a good time. So nice to be with Peter and Pauline and their girls. Josephat was another of our street guards that we enjoyed visiting with. We slipped back to our compound to try and find more guards to take their pictures. Here's Charles and Charles. They are both great men and we will miss our daily contact. Eric kindly drove us to the airport as we left for home. He's a good man and we will miss him. Yes, it has been so interesting to get a peak into your life and work in Kenya. Thank you!